A platform on top of a telephone pole near Westport's Fresh Market was taken down on March 30 by a construction company and then replaced shorty after. WESTPORT — The destruction of an osprey nest on Post Road over the weekend caused a public uproar that compelled the nest’s restoration. “I drove by and saw a male (osprey) sitting on the nest at 8:30 a.m. Saturday morning because I was going downtown. When I went back around 10 a.m. the nest was gone,” said Jo Ann Davidson, a Westport resident. Davidson, a “steward” for The Connecticut Audubon Society’s Osprey Nation citizen science program that monitors osprey nests in town, was obviously sensitive to the osprey’s welfare. But countless residents and employees of nearby stores joined her in speaking out about the eradication of the nest, especially on local blog 06880. The uproar began around noon on Saturday after a contractor for Regency Centers, a real estate investment trust company that owns several properties in town, removed the nest to prepare for upcoming construction work to redo the outside of Fresh Market and upgrade the adjacent parking lot. Two ospreys called the small platform on top of the pole between Fresh Market and Terrain home and, after it was removed, the birds were observed flying around with nowhere to nest. Terrain employees confronted the contractors who allegedly said they were with the Audubon Society, Dan Woog reported on 06880. 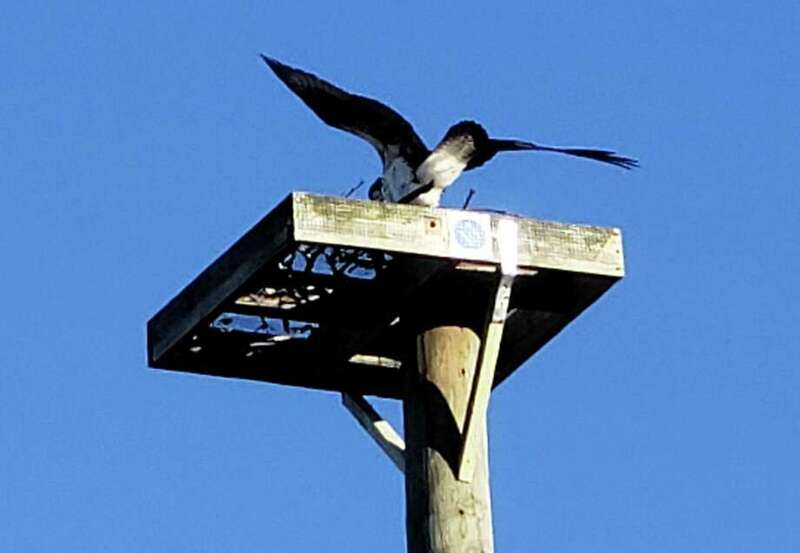 The contractors also didn’t have a permit from the state Department of Energy and Environmental Protection, which is needed to legally remove an osprey nest per the Federal Migratory Bird Act. Online outrcy coupled with complaints to DEEP and local police forced Regency to replace the platform, albeit without the osprey nest. “We were informed that if the nest was not present before the breeding season then the ospreys would be able to make a new nest somewhere else,” Regency Vice President Jack deVilliers wrote in a statement Sunday, adding Regency removed the platform to limit the impact of upcoming construction on the ospreys nesting environment. “However, although our intentions were to mitigate any disturbance to our avian neighbors, we may have missed the mark with seeing the whole picture,” deVilliers said, announcing the restoration of the nest’s platform. Soon after the platform was replaced, the ospreys began work on a new nest and the birds supporters rejoiced. “We’re thrilled the right thing was done. What we’re even more thrilled about is the public interest in all of this. The public really stood up for the ospreys,” said Patrick Comins, executive director of the Connecticut Audubon Society. From about the 1940s through the 1970s, ospreys were endangered due to the prevalence of DDT, a chemical that hindered ospreys reproductive abilities and limited the species population, Comins said. After DDT was banned in the U.S. in 1972, the ospreys made an comeback and there are now more ospreys in the environment than ever, he added. “It speaks to the resilience of the environment when we do the right thing,” Comins said. Town Conservation Department Director Alicia Mozian summarized the rare environmental victory.